Primary comparative texts about Prayer and Piety (includes texts about healing) from Philo, Josephus, Lucian, Pseudepigrapha, Babylonian Talmud, Midrash, Philostratus. Primary texts about the Judean-Samaritan Feud and Samaritan Theology. At (Rutgers University Dept of Religion) Mahlon H. Smith's Into His Own: Perspective on the World of Jesus companion to the historical study of Christian texts. "The Ten Lepers," Luke 17:11-19, Martin Luther, c. 1525. "Christ does good even to those who will be unthankful, but the benefits of God to salvation only profit those who are thankful." "A sense of our spiritual leprosy should make us very humble whenever we draw near to Christ...Only one of those who were healed returned to give thanks. It becomes us, like him, to be very humble in thanksgivings, as well as in prayers." "...their common misery drawing these poor outcasts together (2Ki 7:3), nay, making them forget the fierce national antipathy of Jew and Samaritan." "His faith had added to it another grace, that of love. His faith had not only saved his body, but he had been born to the new life, his soul was saved." Commentary, Luke 17:11-19, Meda Stamper, Preaching This Week, WorkingPreacher.org, 2013. "The story of the grateful Samaritan offers us another image of who and what matters to Jesus and should, therefore, matter to us." "Second Blessing," David Lose, Dear Working Preacher, 2013. "I think we are in sore need of thanksgiving." "A Thankless Job?" Alyce M. McKenzie, Edgy Exegesis, 2013. "Jesus says to those he heals, 'Congratulations and keep moving. Don't stick around thanking me.'" "How Does the Creature Say Thanks," Nancy Rockwell, The Bite in the Apple, 2013. "Kyrie Eleison," Russell Rathbun, The Hardest Question, 2013. "Is healing not healing if you don't say thank you?" "Jesus commends the man, and points out that it is a foreigner who recognizes the work of God in Jesus. Luke tells this story in part to draw contrasts between those who should have been at the forefront of recognizing presence in Jesus, and those who actually did." "Does it make sense to you that we are called to travel "between Samaria and Galilee" as Jesus did? Why or why not?" "A Priest in a Taxi," Andrew Prior, 2013. Comentario del San Lucas 17:11-19 por Manuel Villalobos Mendoza, Working Preacher, 2013. Commentary, Luke 17:11-19, David Lose, Preaching This Week, WorkingPreacher.org, 2010. "Amid the various ecclesial, ethical, and liturgical reforms of the sixteenth century, Martin Luther was once asked to describe the nature of true worship. His answer: the tenth leper turning back." Comentario del Evangelio, San Lucas 17:11-19, Gilberto Ruiz, WorkingPreacher.org, Luther Seminary, 2010. "Los pasajes bíblicos que ilustran los encuentros entre extranjeros tienen mucha potencial para informar la predicación." "Seeing Healing," Mary Hinkle, Pilgrim Preaching, 2004. "The Untouchables," Tony Jones, The Hardest Question, 2010. "Why does Jesus keep his distance from the lepers and heal them as they?re walking away?" "First Thoughts on Year C Gospel Passages in the Lectionary," Pentecost 21, William Loader, Murdoch University, Uniting Church in Australia. "It should not be difficult to find parallels in our own communities. ?You all know what Muslims are like? was a common response after the bombings." "We see the faith in the one whose beliefs made a difference in the way he acted. I find it ironic that for him to return and glorify God by thanking Jesus, he had to disobey the command from Jesus to go show himself to the priest! When might our thanksgivings to Jesus mean going against what is deemed good and proper?" Holy Textures, Understanding the Bible in its own time and in ours, Luke 17:11-19, David Ewart, 2010. "Unfortunately, this is not really a lesson about gratitude and thanksgiving. This is a lesson about praising God; about honouring God; about trusting God." "'Your Faith Has Made You Well': Healing and Salvation in Luke 17:12-19," Frederick J. Gaiser, Word & World, 1996. "To understand the relation between healing and salvation, as depicted by Luke, we will need to consider another distinction, one made often these days in both medical and popular literature, the distinction between healing and cure." "The Virtue (and Vice) of Gratitude," Ordinary 28, Fr. Gerry Pierse, C.Ss.R., from Sundays Into Silence: Reflections on the Sunday Gospels in the Light of Christian Meditation. Claretian Publications. "True prayer is free and freeing." "Jesus Makes Ten Lepers Clean," Rev. Bryan Findlayson, Lectionary Bible Studies and Sermons, Pumpkin Cottage Ministry Resources. "Healing beyond Expectation," The Politics of God: The Way to the Cross, Eugene C. Kreider, Texts in Context, Word & World, Luther Northwestern Theological School, 1986. "This pericope is most likely a traditional healing story expanded into a story of faith and, as such, becomes further commentary on discipleship in Luke's Gospel." Wellspring of the Gospel, Ordinary 28, Catherine McElhinney and Kathryn Turner, Weekly Wellsprings. "When have you taken healing - love - for granted?" "The Thankful Leper," Dr. Ralph F. Wilson, Joyful Heart Renewal Ministries. "What do you think the lepers expected when they called out to Jesus for mercy?" "Putting Faith in Perspective," a study from the Biblical Studies Foundation. "This man is a picture, a prototype of all of those Gentiles who were to be saved by recognizing Jesus to be God?s salvation. This man did not have all of the benefits which the Jewish lepers did, all of the background, all of the exposure to the Scriptures, but He did come into contact with Jesus, and when He did he not only obeyed Him, He trusted in Him as the Messiah. And because of his faith, he was saved." "The Historical Jesus and the Historical Samaritans: What can be Said? ", John. P. Meier, Biblica, 2000. "White theologians should study racism as seriously as they investigate the historical Jesus." Betz, Hans Dieter, "The Cleansing of the Ten Lepers," Journal of Biblical Literature, 1971. Carroll John T., "Between Text & Sermon, Luke 17:11-19," Interpretation, 1999. Clifton-Soderstrom, Michelle, "Recalling Luke's Healer: Slave Doctoring as Liberative Healing," Ex Auditu, 2005. Cogan, Mordechai, "For We, Like You, Worship Your God: Three Biblical Portrayals of Samaritan Origins," Vetus Testamentum, 1988. Dawn, Maggi, "The Untouchables," The Christian Century, 2007. Dawsey, James M., "Jesus' Pilgrimage to Jerusalem," Perspectives in Religious Studies, 1987. Duke, Paul D., "Down the Road and Back," The Christian Century, 1995. Enslin, Morton S., "The Samaritan Ministry and Mission," Hebrew Union College Annual, 1980. Gaiser, Frederick J., "'Your Faith Has Made You Well': Healing and Salvation in Luke 17:12-19," Word & World, 1996. Hamm, Dennis, S.J., "What the Samaritan Leper Sees: The Narrative Christology of Luke 17:11-19," The Catholic Biblical Quarterly, 1994. Harris, Mark, "And Jesus Laughed," The Christian Century, 2001. Neyrey, Jerome H., S.J., "Lost in Translation: Did It Matter IF Christians 'Thanked' God or 'Gave God Glory'?" Catholic Biblical Quarterly, 2009. Radillo, Rebeca M., "The Embodiment of Enmity," The Living Pulpit, 2004. Roschke, Ronald W., "Healing in Luke, Madagascar, and Elsewhere," Currents in Theology and Mission, 2006. Sanneh, Lamin, "Tales of Miraculous Healing," The Christian Century, 1989. Sholis, Barbara, "Windfall," The Christian Century, 2004. Stagg, Frank, "Luke's Theological Use of Parables," Review & Expositor, 1997. "Where Are the Other Nine?" Pastor Edward F. Markquart, Grace Lutheran Church, Seattle, Washington. "Gratitude Is More Than Saying Thanks," the Rev. John Thomas, Day 1, 2004. "The Leper Who Said Thank You," Illustrating the Story (lessons, children's sermons), coloring pages, activity sheets, crafts, children's songs. MSSS Crafts. "Jesus Heals Ten Lepers," Sunday School Lessons: Family Bible Study, art projects, music, stories, etc. "A Thankful Leper," children's sermon, coloring page. Charles Kirkpatrick, Sermons 4 Kids. 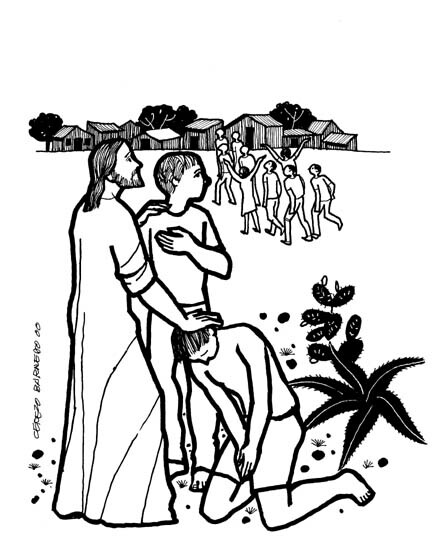 "Jesus Heals Ten Lepers," children's study, puzzles, coloring sheet, etc. Higher Praise Christian Center. "Shreds of Hope," a monologue, Jim Hatherly. "The Lepers of Ginae," from A Certain Jesus by Jose Ignacio and Maria Lopez Vigil. Ideal for catechetical and liturgical dramatization of today's gospel. Claretian Publications. "Waiting in Line," John McNeil, dramatix. "Ten Lepers," Kent Suss, dramatix. Clip Art, Luke 17:17, Fr. Richard Lonsdale, Resources for Catholic Educators. Luke 17:11-19 at Cerezo Barredo's weekly gospel illustration. Liberation emphasis. The Leper Thanks Jesus, Henry Martin, sermons4kids.com. Jesus Heals the Ten Lepers PowerPoint Slide Masters. Henry Martin, sermons4kids.com. Hymns with Scripture Allusions: Luke 17:17. The Cyber Hymnal.